I was shocked when I opened Sunday’s paper and saw, on the front of the Local section, that a stunt pilot working the control stick of a biplane had crashed and died during an airshow Saturday at Wheeler Downtown Airport. With my attention riveted, I proceeded to gobble up the story, written by Mike Hendricks and Glenn E. Rice. Appropriately, the story took up more than half of the section front and included a photo of a couple embracing after witnessing the tragedy. More information about the crash and quotes from witnesses took up the first two columns of the jump. Then, out of the blue, the story took an odd, sharp turn. After an awkward transition recounting an earlier rain delay, the story proceeded to describe some attractions that people attending the show had seen earlier Saturday. That material consumed the final eight inches of the story, which ended with no further mention of the crash. The story was totally bifurcated: The fiery crash and tragic loss of death on one hand, and, on the other, an account of people cheering the U.S. Army Golden Knights parachute team hours before the crash…followed by more drivel. It was incongruous and inappropriate. What happened, obviously, is that Glenn Rice, whose name followed Hendricks’ on the byline, was dispatched to the airshow in the morning to write a feature story. Then, immediately after the crash, Hendricks probably was called in from home — or perhaps he had drawn a Sunday shift — to cover the aftermath of the crash. So, both reporters came back to the office, each with divergent material. The next step — again obvious to anyone who knows how a newsroom works — is that an editor asked each of them to write up their material. Then, the editor made Hendricks’ material about the crash the “lead” or top part of the story and dropped in Rice’s material after the awkward transition. In my opinion, the decision to include the mundane material about what had transpired earlier in the day was ridiculous. It was disrespectful to Jensen, his family and the other, grieving airshow participants. The crash rendered everything else irrelevant. Airshow officials had the good sense to shut the show down immediately after the crash. Star editors should have had the good sense to shut down their story at the conclusion of the crash account. Now here’s a mystery for you. In Sunday’s New York Times, two section fronts carried stories with almost identical headlines and similar, large photos. 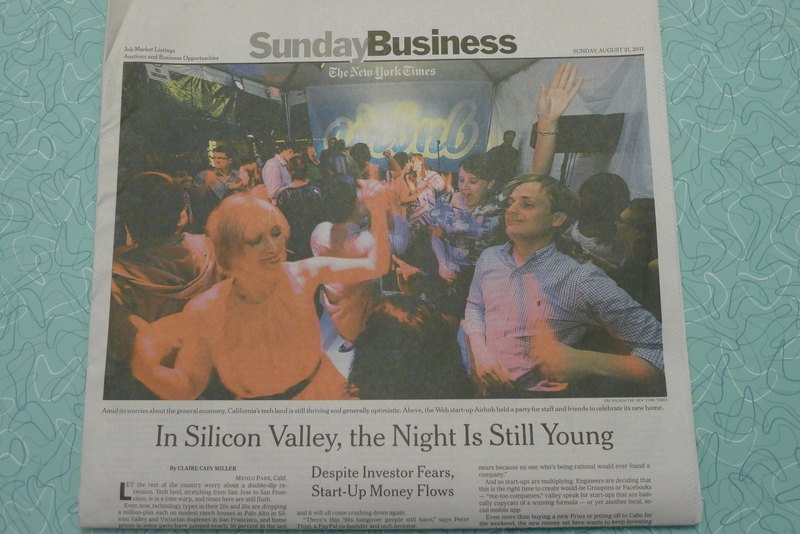 A section or two removed from Styles, the Business section was led by a story about how the good times are rolling in Silicon Valley, despite the overall economy. Were the mirror-like sections intentional or a blunder? At first, I was convinced it was a big screw-up; that the weekend editors missed seeing the forest for the trees. But later, my wife Patty, who often picks up subtleties faster than I do, said the sections fronts were too similar not to have been coordinated. She liked it. 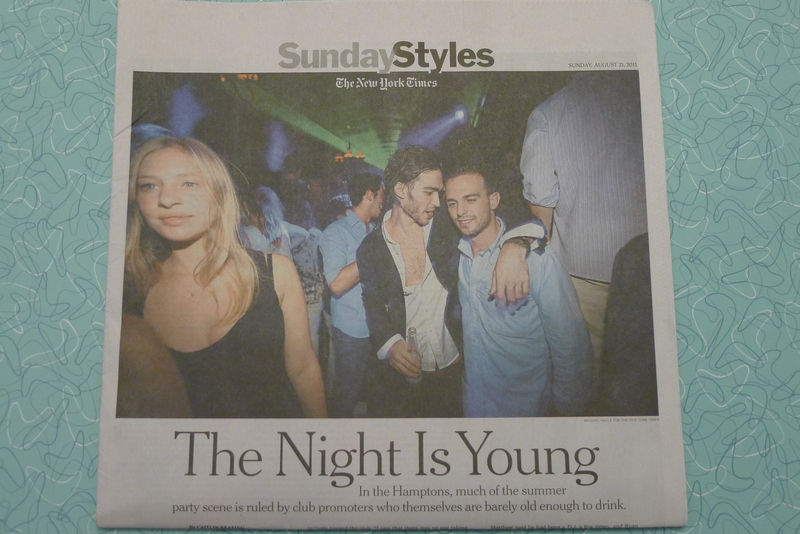 She also pointed out the wording of the headlines, with one saying, “The Night is Young” and the other saying, “The Night Is Still Young,” as if one played off the other. I sent an e-mail to Art Brisbane, public editor of The Times and former Kansas City Star publisher, to see if he had the answer to the mystery. Brisbane, who is not involved in day-to-day operations at The Times, replied last night that he didn’t know. On Sunday afternoon, I picked up one indication that the parallel presentations could have been accidental: On its website, The Times had substituted a different photo with the Silicon Valley story than the one that appeared on the section front. The new photo showed three young entrepreneurs, standing on chairs and talking to people attending the party. But the guys were the only people in the photo, making it very different than the original party pic. I asked Art to let me know if he solved the mystery today. I’ll keep you posted. As they say Fitz, God is in the details. Nice observations. I had hoped that with the arrival of Mi-Ai Parrish that by now we would see some sort of improvement in the quality of writing, if not the quality of writers at The Star. I also had expected that by now we’d get a Mi-Ai Manifesto or at least a glimpse of her Journalistic Temperament. Seems like meet the new boss, same as the old boss. She’s probably not trying to jump to conclusions or stir the pot too quickly, Smartman. If she’s smart, which her background and rapid rise would indicate, she’ll take it nice and slow, watching and reflecting. I think we will see a Mi-Ai Manifesto, or at least a Mi-Ai Memo, within a few months. It’s not possible for a publisher to call the editor and say, “I want to see better writing,” and, bingo, have it served up on a platter. If that’s one of her goals, it’s going to be a lengthy process. 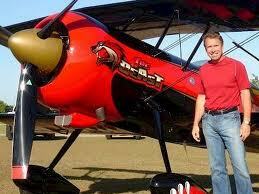 He was was a stunt pilot for 17 years and total more than 20 years of piloting.